When Exchange Server reads a database page from an Exchange store file (priv.edb), it may find that page to be either uninitialized or empty. This could be caused by an issue inside of Exchange, such as incorrect links or pointers between database pages. Generally, this problem is related to corruption in the underlying file system or incorrect mapping of pages into the database file. In such cases, the page number field on the requested page that was expected to be in use is always ‘0x00000000’. This further result in -1018, and -1019 errors (JET_errPageNotInitialized) with Event 476 being logged to the application log file of Event Viewer. You should perform system diagnostics tests. This may not help to isolate the root cause if the error is not frequently seen. You can think of migrating to a different hardware to resolve the error. Ensure that the disk controller BIOS and the firmware on your computer are up-to-date. You may use a backup program to restore the database from an online backup. If this operation fails, the damaged page was not present in your most recent backup. Perform an offline defragmentation of your database using the ‘Eseutil’ tool with ‘/d’ option. This will enable you to discard or expunge all empty pages and secondary pages in the database. Repair your database using the ‘Eseutil’ tool with ‘/p’ option. This procedure will discard all bad pages in your database. Data loss occurs if the damaged page is a leaf page. If the aforementioned methods fail to rectify the Database page read failed verification issue, you should use Exchange EDB Recovery software. The software uses a streamlined and user-friendly approach to repair damaged Exchange Server database files. It can easily repair Unicode-formatted EDB files and restore individual user mailboxes as Outlook PST files. Using this competent utility, you can also get back all your accidentally deleted mailboxes intact. 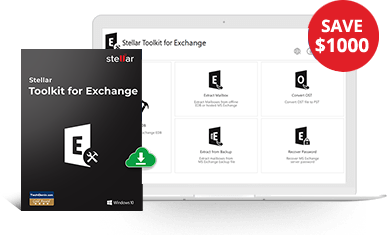 Stellar Repair for Exchange supports MS Exchange 2019, 2016, 2013, 2010, 2007, 2003, 2000, and 5.5.